Ridgecrest is located in the southern portion of the Indian Wells Valley and in the northeast corner of Kern County, surrounded by four mountain ranges; the Sierra Nevada on the west, the Cosos on the north, the Argus Range on the east, and the El Paso Mountains on the south. It is approximately an hour and quarter from the Lancaster/Palmdale area and approximately two hours from both Bakersfield and San Bernardino. A favorable characteristic of the City is its proximity to two major highways, the 395 and 14. Air travel in and out of the city is provided through the Inyokern Airport. These attributes make Ridgecrest, a central location for shopping and business for the Eastern Kern County area. Ridgecrest evolved into a growing and dynamic city during the 1950’s and 1960’s as a support community, vital to the mission of the Navy, by providing housing and services for Federal employees and contractors. Ridgecrest incorporated in 1963 and now provides shopping and services for over 40,000 people throughout the Indian Wells Valley. China Lake Naval Weapons Center (NWC) and now the China Lake Naval Air Weapons Station (NAWS) is home to the Naval Air Warfare Center Weapons Division, which continues to be the major source of employment for Ridgecrest residents. The economic stability of Ridgecrest as service community for the NAWS has been essential to its successful emergence as a community in its own right. .
As the only incorporated community in the Indian Wells Valley, Ridgecrest boasts a thriving economy and a robust population of just over 27,000 people. Ridgecrest acts as the shopping and business center for northeastern Kern County. 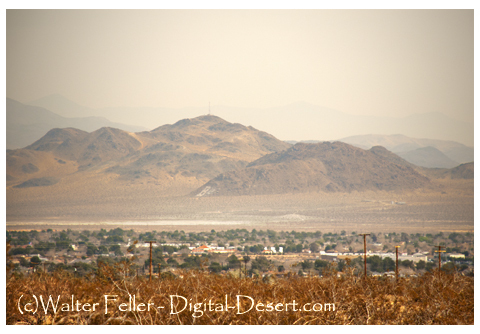 Largest community in the Indian Wells Valley, the rapidity of its growth has been approached by few California cities. This community, within the brief period of 30 years, has expanded into a thriving trading center for some 30,000 people, 22,000 of whom reside in Ridgecrest, Inyokern, China Lake (NOTS) and immediate environs. In the 1920s, the site of Ridgecrest was homesteaded property, with alfalfa as a principle crop. In the 1930s, Crum brothers were operating a small dairy to serve Trona and Westend. because of an adequate housing for families of workers at those industrial communities,a group of employees purchased lots at the present Ridgecrest site and erected homes. The ladies of the small village decided that it should be called "Sierra View," the post office officials notified them that it would be Ridgecrest because there were too many cities already using " Sierra" as part of their names. When the first store was erected in 1939, there were but 15 homes. Little change took place in the struggling down until 1943, when the Navy came streaming into the valley with trucks, bulldozers, cranes and other equipment to build the Naval Ordnance Test Station at adjacent China Lake. The impact on Ridgecrest was immediate. Almost overnight, the village became a teaming center of activity with the erections of stores, homes, schools and churches, service and utility facilities following one after the other.